More Americans are killed by Heroin overdose then guns. The number of Americans killed last year by heroin overdoses surpassed the toll of those who were shot to death, according to U.S. government data released this week. Deaths from heroin and other opioid drugs, both legal and illegal, have been rising at a higher rate than gun deaths for years, but the figures from 2015 reflect a dramatic shift since 2007, when gun homicides outnumbered heroin deaths by more than 5-to-1, the U.S. Centers for Disease Control reported Thursday. 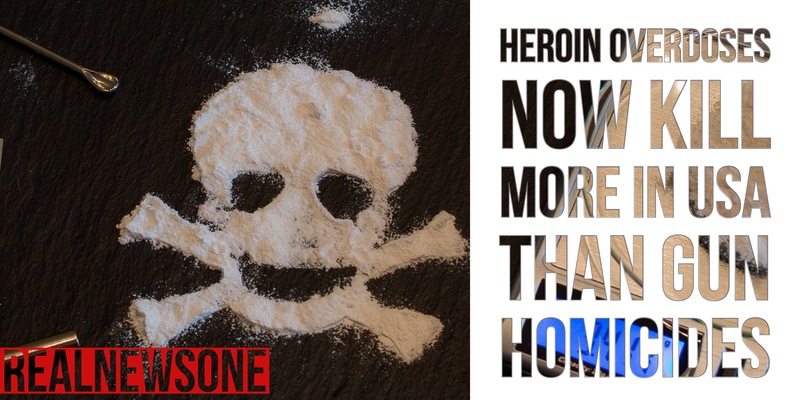 Deaths from heroin overdoses spiked by 23 percent in 2015, up to 12,989, the CDC said, while the number of gun homicides rose to 12,979. Overall, drug overdoses killed more than 50,000 Americans last year, according to the CDC report. “I don’t think we’ve ever seen anything like this, certainly not in modern times,” said Robert Anderson, chief of mortality statistics at the CDC. Most of the drug deaths were due to overuse of opioids, a class of drugs that act on the central nervous system to relieve pain, including heroin and other illegal drugs, such as fentanyl. Opioids also include painkillers such as Oxycontin and Vicodin, which may be prescribed by physicians but also are used illegally. On Wednesday, Congress passed the 21st Century Cures Act, which will allocate $1 billion to fight the opioid epidemic. The money will be used for addiction treatment and prevention programs. In contrast to drug-overdose deaths — 52,404 overall in 2015, the CDC said — the number of people killed in automobile crashes was 37,757. Gun deaths, dominated by suicides over homicides, totaled 36,252. The annual tally of deaths and death rates followed another round of CDC data earlier in the week that showed the overall life expectancy for U.S. residents had dropped slightly from 78.9 years in 2014 to 78.8 years in 2015. It was the first such decline since 1993.